In 2015, BEKO launched its brand new advertising campaign to support its global Premium Partnership with FC Barcelona. The campaign, which celebrates team spirit., features FC Barcelona’s best known football players including Lionel Messi, Neymar Jr., Gerard Piqué, Luis Suárez and Andrés Iniesta working together, both on the pitch and at home, showing how they inspire and support each other as a team. Barcelona’s winning spirit is captured perfectly, showing fans how team spirit really can implement change for the better. Part of this partnership is the global consumer raffle promotion entitled “Witness the Victory 2.0!” Experience Camp Nou and Enjoy Barcelona for Free. Now on its second year, the raffle promo runs from November 1, 2016 until January 15, 2017 and is open to all buyers of BEKO products. There will be a Qualifying Round that will be held on January 14, 2017 with registration from December 3 to January 7, 2017. Participants of the Qualifying Round shall be given three (3) attempts within one (1) minute each to try and kick the ball inside a customized mock up washing machine goal from a designated distance of twenty (20) feet. There shall be a knock-out phase and the Top Ten (10) participants who successfully made the most number of goals shall move-on to the Grand Kick-Off Challenge. During the Final Round on February 9, 2017, the top 10 participants shall be given three (3) attempts within one (1) minute each to try and kick the ball inside a customized mock up washing machine goal from a designated distance of twenty (20) feet. The participant with the most goals shall be declared the grand winner. In case of a tie, the shoot around with 3 attempts and one minute limit shall be repeated until one emerges as the grand winner. 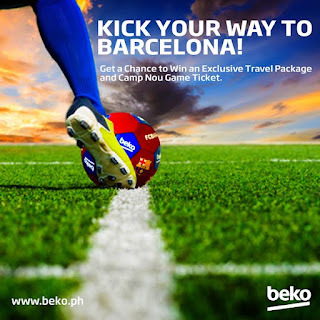 The 10 Contestants (Qualifiers) who will reach the Final Round will be given a specially designed Beko FC Barcelona Gym Bag. Sparta Philippines, the country’s only indoor football pitch located in Mandaluyong City, is the venue of the Kick-off challenge event.